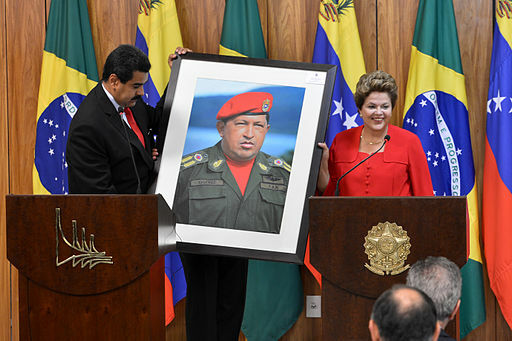 ‘Washington is activating measures at the request of Venezuela’s fascist right, who are emboldened by the coup in Brazil,’ said the nation’s president. The country is struggling with widespread blackouts, shortages, and looting as the collapse in oil prices has plunged it into economic turmoil. On Friday night, Mr. Maduro delivered a televised national address in which he directly accused the U.S. of seeing to foment his ouster. 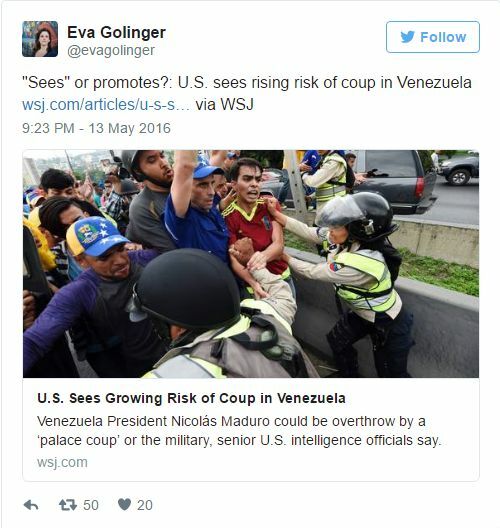 “Washington is activating measures at the request of Venezuela’s fascist right, who are emboldened by the coup in Brazil,” he said. The United States is increasingly concerned about the potential for an economic and political meltdown in Venezuela, spurred by fears of a debt default, growing street protests and deterioration of its oil sector, U.S. intelligence officials said on Friday. In a bleak assessment of Venezuela’s worsening crisis, the senior officials expressed doubt that unpopular leftist President Nicolas Maduro would allow a recall referendum this year, despite opposition-led protests demanding a vote to decide whether he stays in office. But the two officials, briefing a small group of reporters in Washington, predicted that Maduro, who heads Latin America’s most ardently anti-U.S. government and a major U.S. oil supplier, was not likely to be able to complete his term, which is due to end after elections in late 2018. “You can hear the ice cracking. You know there’s a crisis coming. Our pressure on this isn’t going to resolve this issue,” one official told the news service. This entry was posted in Austerity, Civil Rights, Corruption, Demonstrations & Protests, Economics, Elections, Energy, Government, International Agreements, National Security vs Police State, Uncategorized and tagged Atrocities, Brazil, Capitalism, Civil Rights, Corruption, Democracy, Economics, Elections, Energy, International Agreements, Nicolas Maduro, Oil, political coup, Protests, Security, Venezuela on May 16, 2016 by ew.